For the price, this knife is surprisingly well built, balanced, and feels great in the hand. The Zyzel handles and large finger choil make handling the knife a pleasure. The liner lock is very solid, as is with my other CRKT knife that I own (M16-13Z). 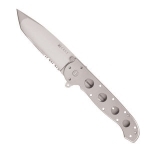 The oversized thumb studs make opening the knife very easy and the blade snaps into place very smoothly. 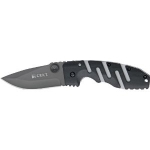 CRKT's LAWKS safety system turns this tactical folder into a virtual fixed blade, plus adding to the safety that the blade will not close by accident. My only regret is that the pocket clip is NOT designed for versatile carry and is only available in right-side, tip-down carry. Despite the clip issue, I absolutely love the feel and design of this knife and although some may feel that 5.6oz may seem a bit heavy for an EDC, this one is going to be in my EDC rotation for a long time. 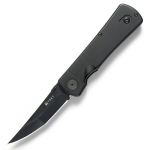 Very highly recommended for those looking for an inexpensive, yet very well designed and functional tactical folder.